A readability score, or index, is an estimation of how difficult a text is to read. If you aren't familiar with what a readability index is and what it measures, we invite you to read our treatment of the topic here. 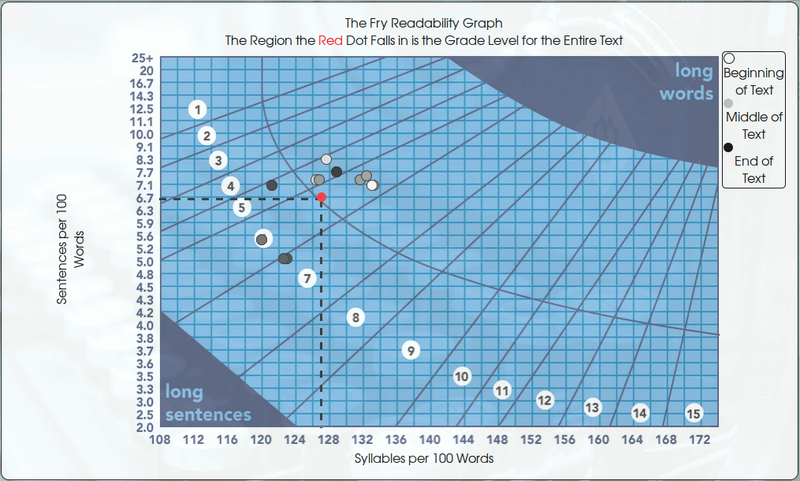 The Fry readability score is a visual assessment of a text's grade level. 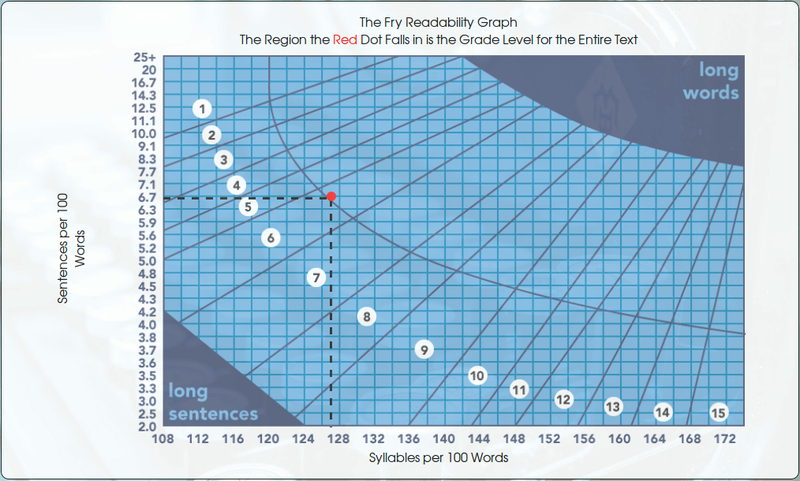 For a sample of text we plot the number of syllables per 100 words on the horizontal axis (x-axis), and the number of sentences per 100 words on the vertical axis (y-axis). The region this point falls is an estimation of grade level. The traditional method, developed by Edward Fry (A Readability Formula That Saves Time, Journal of Reading (1968)), is to take three 100-word samples, each chosen from a random starting point and compute the above point. 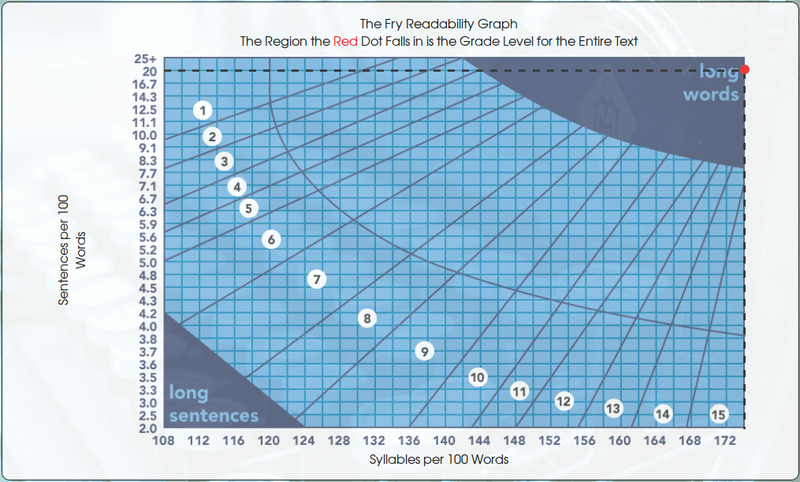 Taking the average of these three points and plotting them on the Fry graph (seen below) gives us an estimation of the grade level of a text. Since computers weren't widely available to the public when Fry developed the above formula, his method was fast, accessible, and could be calculated quickly on paper so that educators or anyone else could objectively estimate the reading level of a text. Modern computing, however, allows us to not only compute the above statistic for several 100-word samples, but to perform the above task for the entire text almost instantaneously. This website calculates the Fry Readability Score for the entire text. We shall estimate the grade level of the text "The Happy Prince," by Oscar Wilde. 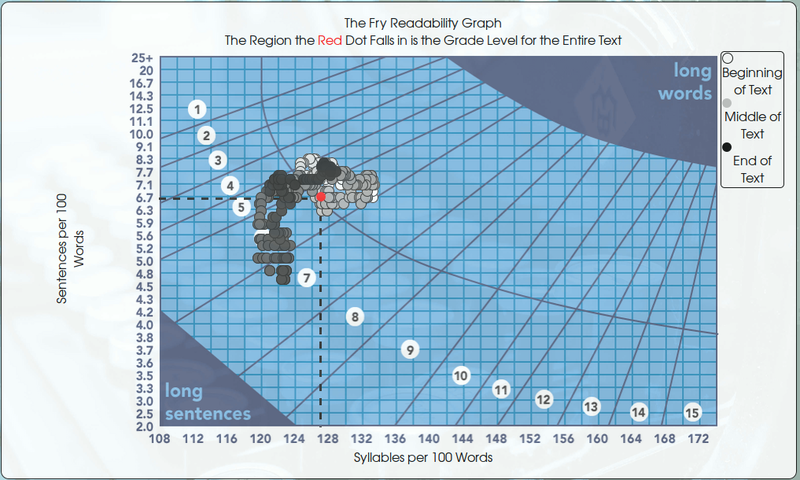 Below is the Fry Readability graph for the entire text (red dot). The dot falls in the region labelled "6," which means the grade level of the text is about sixth grade. The engaged reader should run the same test on our homepage. On this website, provided your text contains more than 600 words,	you may calculate the Fry Readability Score for as many random 500-word samples of your text as you like. Below is the same graph as above with several randomly chosen 500-word samples. The darkness of the dot represents where in the text the sample was taken from. Lighter dots indicate that the a 500-word sample closer to the beginning of the text, whereas darker dots indicate a sample closer to the end. You may also plot every 500-word sample from the beginning to the end of the text as seen below. We can see from the above graph that the grade level estimations of most 500 word samples of "The Happy Prince" lie mostly between 5th and 6th grade with the average (red dot) lying in the 6th grade region. Dashjkldsfhjlksadfhjlkdf daseuioepruoad dsfjklasdfnjklsadf and dsajgkquzndjwisnw! we get an an inconclusive result as seen below. Edward Fry set out to make the readability of a text a reasonably easy thing to objectively estimate. And likewise, at Analyze My Writing, we strive to give you tools that make estimating the reading level of	a text a little easier. Fry, E. B. 1968. A readability formula that saves time. Journal of reading 11:513–516. Article on this Website: What is a Readability Index? Wikipedia Article on Readability surveying various indices. Wikipedia Article on Fry Readability Formula.